Cox Automotive Leasing Study - Cox Automotive Inc. There is a promising market for used vehicle leasing. According to the KBB.com Leasing Survey, 78% of consumers would consider leasing a used vehicle. Lower monthly payment is the primary reason consumers choose to lease a vehicle instead of buying. Used/CPO leasing also offers other sought-after leasing features, including flexible/more frequent vehicle replacement options and the peace of mind that comes with extended warranties and maintenance plans. Used and CPO vehicle leasing is good for OEMs and dealers. It can maximize the ROI of off-lease inventory residual value, create more in-market shoppers, increase service retention and counter the trend toward longer-term loans that keep consumers out of the market for longer periods of time. New vehicle leasing peaked in 2016. Since then, the cost advantage of leasing over the average auto loan has decreased, causing the leasing rate to drop and then plateau ever since. This challenge is compounded by the nearly 3.9 million off-lease vehicles expected to re-enter the market in 2018, potentially putting more downward pressure on residual values and causing new vehicle lease payments to rise. 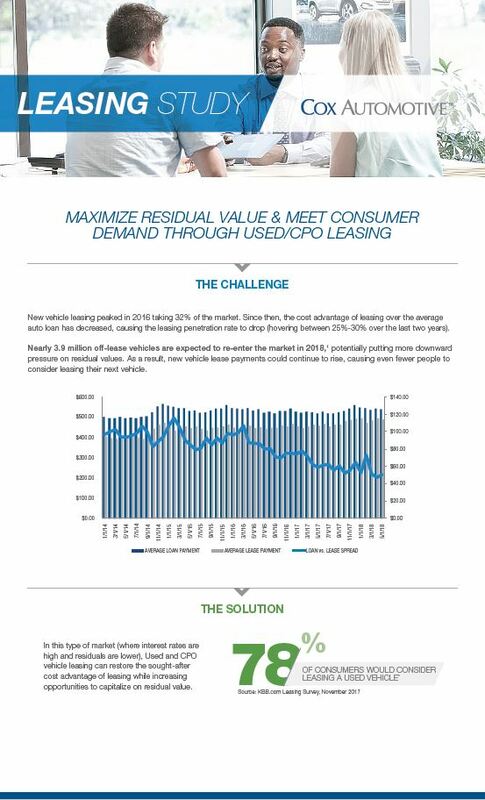 This infographic shows how Used and CPO leasing can restore the sought-after cost advantage of leasing, allowing OEMs and dealers to maximize the ROI of off-lease residual value, more effectively target in-market shoppers, upsell payment-focused customers, boost loyalty, and more. Download the study to learn why Used/CPO leasing is good for OEMs & dealers.